The European Robotics Forum (ERF2018), the most influential meeting of the robotics community in Europe, will be held in Tampere, Finland, on 13-15 March 2018. 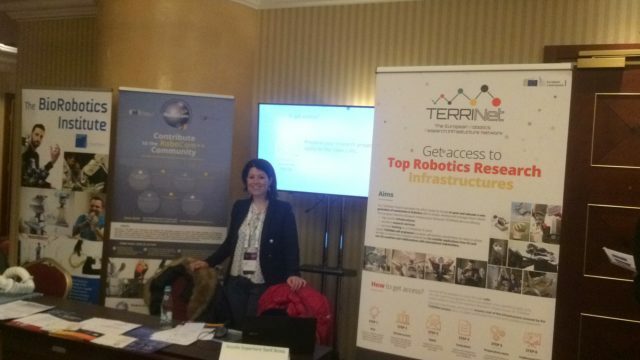 The TERRINet project was presented by its coordinator Prof. Paolo Dario, on 13th and 14th March, in sessions organized by Dr. Cecile Huet about the new H2020 robotics projects in the SPARC strategy and EU Projects offering services. Over 800 European robotics top experts are expected to attend the conference. Under the theme “Robots and Us”, ERF2018 covers current societal and technical themes related to the field of robotics. Interesting subjects will be discussed, including human-robot-collaboration and how robotics can improve industrial productivity and service sector operations. Researchers, engineers, managers, and a growing number of entrepreneurs, business people, and public funding officers from all over Europe come together to discuss technology push and market pull and how innovation in robotics can be accelerated.